Ultrasound elastography is a new technique that generates images or quantitative data based on the stiffness of a tissue. Tissue stiffness changes in many disease states, including softening of edematous tissues or hardening of malignant lesions. Elastography has been shown to provide clinically useful information in many organs.1-13 This article reviews clinically useful applications. Two types of ultrasound elastography are currently available. * For the purposes of this article, we will focus on compression strain elastography. Compression strain elastography evaluates how a tissue deforms when an external or patient-induced force is applied to the tissue. Soft tissues deform more; hard tissues deform less. For example, if a gelatin mold contains a glass marble and the mold itself is externally compressed, the gelatin would change shape while the marble would not. The algorithm analyzes the frame-to-frame differences with compression. The more a tissue deforms, the softer it is. This technique is considered qualitative and is relative to a given patient. The resulting images are displayed on a scale of the relative tissue stiffness in the field of view.4 Some analysis can be generated using such strain as compression strain/Bmode measurement comparison ratios and relative strain value displays and comparisons. Compression strain elastography can be performed on any tissue from which a B-mode image can be obtained. This article concentrates on 3 primary elastography applications: breast lesion characterization, musculoskeletal assessment, and gynecologic pathology. Compression strain elastography has been shown to improve characterization of breast lesions as benign or malignant.6-10 Compression strain requires only a few minutes of additional scanning. Benign breast lesions appear smaller on compression strain imaging, while malignant lesions appear ≥ in size to the same lesions on B-mode imaging. This phenomenon is unique to breast tissue. Figure 1 is a biopsy-proven fibroadenoma. Note that the lesion measures 1.03 cm on B-mode, but 0.80 cm on elastography—a strain/B-mode ratio of 0.78, suggestive of a benign lesion. Figure 2 is an ultrasound scan of a patient who presented with an abnormal screening mammogram. 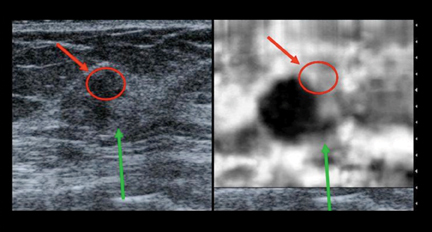 On B-mode imaging, the lesion has a superior portion outlined by a red circle, a central hypoechoic mass, and a finger of tissue inferiorly (green arrow). Note that on the elastogram, the superior portion is color-coded white (soft), while the central mass is color-coded black (hard) and is larger than in the B-mode image (strain/B-mode ratio of 1.5). The finger of tissue inferiorly is also color-coded black and appears larger on the B-mode image. Pathology revealed the central mass and finger of tissue to be invasive ductal carcinoma, as suggested by the increase in size. The area in the red circle was a benign fibroadenoma, as predicted benign by the elastogram. In a large multicenter trial7 the sensitivity and specificity of this size change to distinguish benign from malignant lesions were 98.5% and 85%, respectively. Musculoskeletal elastography is in its infancy.14-17 Current studies show that tendons are one of the stiffest tissues in the body. Pathologies, such as tendinitis or tears, can cause the relative stiffness to lessen. Magnetic resonance imaging (MRI) is considered the standard technique for evaluating these changes. However, ultrasound elastography may be able to evaluate these changes at a lower cost than MRI and allow monitoring of healing. Ultrasound also has the ability to evaluate the dynamics of muscles and tendons. It is also easy to obtain the contralateral images for comparison. Figure 3 is the elastogram from a patient with lateral epicondylitis. Soft tissue is color-coded red, while stiff tissue is color-coded blue. The normal tendon is stiff (blue), while the area of tendinitis is soft (red). In Figure 3, the area of tendenitis is identified as the red area within the tendon. After conservative treatment, the tendinitis has improved clinically, and the area which was previously abnormal has returned to a normal appearance. 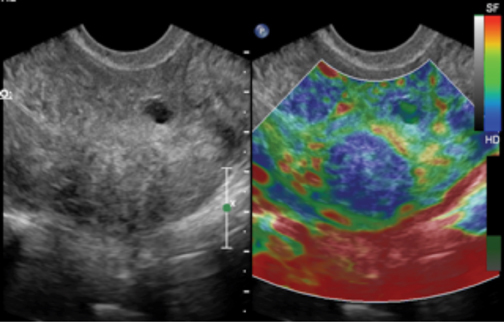 With the addition of strain elastography to the endocavitary probe, high-quality elastograms of the uterus and ovary can now be obtained. Early studies demonstrate that uterine fibroids can be characterized by their stiffness using elastography. Some uterine fibroids can be better visualized using strain, especially if they are significantly stiffer than the adjacent uterus (Figure 4). The bull’s eye artifact, which has been described in breast tissue,8 also occurs in ovaries. This could be helpful in classifying complicated ovarian cysts as benign, as this artifact only occurs when low viscocity fluid is present. Since the elastograms are generated based on frame-to-frame changes in B-mode, done as post-processing, this technique can be used in fetuses without additional energy input. Ultrasound elastography is a rapidly evolving technology shown to be an important adjunct to B-mode imaging in many exams, including those of the breast, thyroid, musculoskeletal system, liver, prostate, and female reproductive system. The technology has been shown to be most advanced in breast imaging, where it has demonstrated a major impact on lesion characterization. Elastography is an exciting development that has the potential to expand ultrasound into more diverse clinical roles as well as to improve clinical outcomes across many applications. *Only qualitative strain compression elastrography is available on Philips products in the U.S. and shear wave is not available on Philips products in the U.S.
Takahashi H, Ono N, Eguchi Y, et al. Evaluation of acoustic radiation force impulse elastography for fibrosis staging of chronic liver disease: A pilot study. Liver Int. 2010;30: 538-545. Friedrich-Rust M, Wunder K, Kriener S, et al. Liver fibrosis in viral hepatitis: Noninvasive assessment with acoustic radiation force impulse imaging versus transient elastography. Radiology. 2009;252:595-604. Seeff LB, Hoofnagle JH. National Institutes of Health Consensus Development Conference: Management of hepatitis C: 2002. Hepatology. 2002;36:S1-S2. Barr RG. Sonographic breast elastography: A primer. J Ultrasound Med. 2012; 31:773-783. Barr RG, Zhang Z. Effects of precompression on elasticity imaging of the breast. J Ultrasound Med. 2012; 31:895-902. Barr RG. Real-time ultrasound elasticity of the breast: Initial clinical results. Ultrasound Quarterly. 2010;26:61-66. Barr RG, Destounis S, Lackey, LB II, et al. Evaluation of breast lesions using ultrasound elasticity imaging: A multicenter trial. J Ultrasound Med. 2012; 31:281–287. Barr RG, Lackey AE. Predictive value of the “bull’s eye” artifact on breast elasticity imaging to characterize cysts. Ultrasound Quarterly. 2011;27:151-155. Tanter M, Bercoff J, Athanasiou A. Quantitative assessment of breast lesion viscoelasticity: Initial clinical results using supersonic shear imaging. Ultrasound in Med. & Biol. 2008;34:1373-1386. Berg WA, Cosgrove DO, Dore CJ, et al. Shear-wave elastography improves the specificity of breast US: The BE1 multinational study of 939 masses. Radiology. 2012;262:435-449. Barr RG, Memo R, Schaub CR. Shear-wave ultrasound elastography of the prostate: Initial results. Ultrasound Quarterly. 2012;28:13-20. Lyshchik A, Higashi T, Asato R, et. al. Thyroid gland tumor diagnosis at US elastography. Radiology. 2005;237:202-211. Dighe M, Bae U, Richardson ML, et. al. 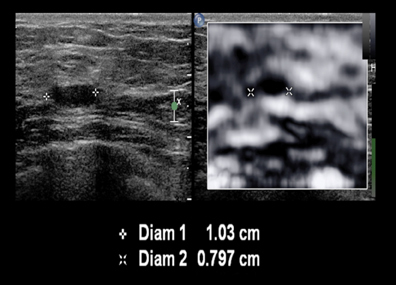 Differential diagnosis of thyroid nodules with US elastography using carotid artery pulsation. Radiology. 2008;248:662-669. Improving patient outcomes with ultrasound elastography. Appl Radiol.